We took a 6 hour bus ride from Saigon to Phnom Penh. As soon as we arrived at the Vietnam-Cambodia border we were blown away by the written Khmer language. It is an art form in itself. The drive through Cambodia to Phnom Penh was amazing. Wats seemed to line the streets. 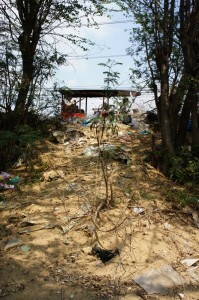 As we approached Phnom Penh, we saw more and more Wats. Until it was about 1 wat every half mile. Our necks hurt from constantly looking at interesting buildings, and monuments, and people. We were in for a treat. We saw this little girl riding on the back of her dad’s scooter. Cambodia – Perfectly acceptable. At home – immediate call to child services. One of my favorite things were the roadside gas stations. 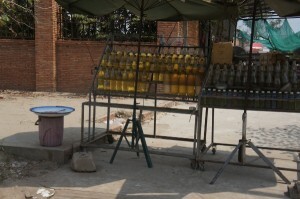 Coca-Cola is sold by the liter, gasoline is sold by the liter, so why not fill up old coke bottles with gasoline and sell them by the roadside? We hired a tuk-tuk to drive us around for the day. While we were driving, I wanted to get a picture of houses on stilts above rice fields. I told the driver to pull over when I found a great shot. The perfect panoramic was waiting for me. Chickens and lizards scurried in every direction as I descended the bank of litter. I was rewarded at the bottom with these beautiful views! Then two boys started screaming with joy and jumping up and down in one of the homes. They knew “Hello” and “Thank you” in english. So they screamed both of the phrases and started running at me. They were so excited to see a foreigner and their smiles were ear to ear. They saw my camera, and after a couple of gestures I realized they wanted their picture taken. Their home is the house behind them on the left. In all their excitement for the photo, the older boy puts his arm around his younger brother and they both give me the peace sign. After our encounter with the boys, Leah and I headed back into the city. 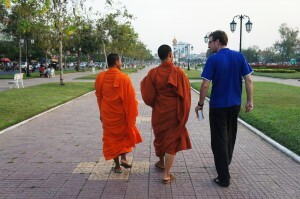 While walking to the main park, I said hello, in Khmer, to a couple of monks. They were impressed with the couple of words of Khmer we had picked up and they walked and talked with us for a while. 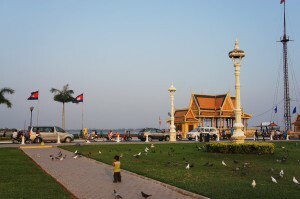 The city of Phom Penh is built right on the banks of the Mekong River. There was a massive park where Leah and I people watched for a while and watched the sunset. Peddlers sold food to families having picnics. It was the hangout for a lot of people. Notice nobody is on the grass, security guards blew whistles if you tried to sit on the grass, or even if you looked like you might have the intention of sitting on the grass. 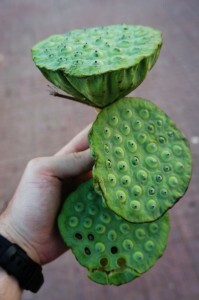 Leah and I snacked on a lotus pod. Each little pod had a peanut sized bud to eat. Their wasn’t much flavor but it was a nice snack while we were in the park. In our excitement to try the lotus, we broke it open and tried a couple before the photo. You can see our damage on the bottom pod. 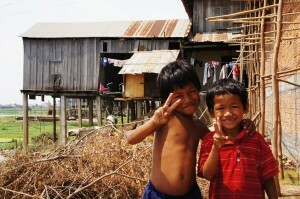 We were met with nothing but smiles in our first day in Cambodia. An amazing first day.